I don’t know whether anyone will be interested in this mini series called Two Dates. However, as all the research shows that extensive reading helps students improve their English I put it here. There is a short story cut into four parts and a mind map which can serve as a comprehension worksheet. Moreover, you can learn the vocabulary from the worksheet and there are two games to practise the new vocabulary. Watch the video and try to understand the story. If you want to make this exercise slightly more challenging, switch off the picture and just listen. 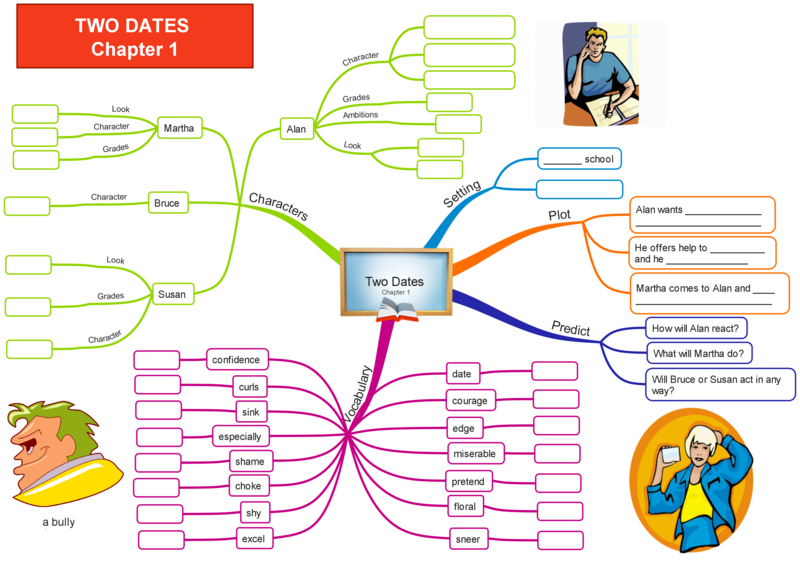 Try to complete the mind map with the information from the story. Use your dictionary and translate the vocabulary. Once you finish the worksheet (mind map) watch the video again and check your answers. In the first game you should write the jumbled word in the correct way. You have always 30 seconds to manage this. In the second game you should complete each sentence with the correct word. Here is the whole story if you do not want to listen to it and just read it. Alan was the wallflower in his class. He was always a little shy and he had no real friends when he was younger, but he always thought that this would change by the time he went to secondary school. Alan did not know why he had such a hard time talking to people, especially girls. He had no problem talking to his mother or sisters at home, but when a girl asked him a simple question in school, he would get nervous, and his whole face would become as red as a tomato as he tried to get the words out. There were two beautiful girls in his class, Susan and Martha. Not only were they beautiful, they were smart and popular too. Susan excelled in English, whereas Martha was better at numbers and was usually the one with her hands up in the air for every question asked during Maths class. Alan was not popular, neither was he particularly handsome. He was neither the tallest boy in class nor the most athletic one. He did not excel in any subject, and his grades were average at best. This did not help his confidence, and it got weaker year by year. But that year, Alan wanted to make a difference. He wanted to be noticed, and he wanted to make friends for once. Their school was organizing a dance, and boys usually asked girls out to be their dates. In the past, Alan usually chose to stay home, watch some television with his parents or play video games. He did not have the courage to ask any girl out, and he certainly did not want to go to the dances alone. He always felt left out when he returned to school the day after, listening to all the fun and good times that his classmates had at the dance. He no longer wanted to be that guy that stayed at home, miserable and alone, without a date. Alan wanted to be different that year. “No, I just wanted to help,” Alan’s voice sounded strange. The whole class laughed at him. Alan sank deeper into his seat and pretended not to care. His ears were burning with shame. He looked down on his homework and tried to ignore the students around him. From the edge of his vision, Alan saw a pair of pretty shoes. He looked up in surprise at Martha’s face. She looked very pretty indeed, showing off her beautiful figure in a lovely yellow floral dress. Her long blond hair was in perfect curls around her sweet face. “Maybe you could help me. Do you want to go out after school?” Martha asked Alan. Alan nearly choked. He could not believe what he was hearing. Martha? Beautiful popular Martha was asking him out on a date! What should he say? I like it! tks…and what about the rest of the etory, parts 2, 3 and 4? The rest of the story will be published soon. I would love to publish Two dates Part 2 today and the rest next week. Sorry about that. The games are in flash and obviously your device does not support flash. However in the second chapter of the story there is a game which will work on your device. It is called Memory game. Thank you Zdenda! I’ll be waiting!!!! Actually I’m planning to use it for a teenagers’ class but I neee to be sure if you will be able to publish the whole story, otherwise my students will get so frustrated… : ) tks!!! the whole story is already finished. Tomorrow, I will publish part 3 (the shortest one) and on Tuesday part 4. I hope your students will find the story entertaining. Thank you so much Zdenda!!!! What you’re doing is fantastic! Thank you! this piece right here is the defenition of hóri and lea olivia. wonderfull!